I strongly believe that anybody can learn how to dance when given the space and patience to explore it. I employ body awareness concepts such as the Feldenkrais Method and imagery in my teaching to guide students towards ideal sensations related to the movement of dance. With this awareness, students learn to hear, see, touch and feel. When this is understood the execution of the movement becomes a natural progression instead of a forced reaction to a command. I have found that this approach helps students to understand how to initiate dance within their own bodies and trust their own sensations to movement rather than imitating the teacher. The body awareness approach levels the playing field of learning for all students. It gives students the tools to self-correct and to investigate the body as a priority in developing as not only as a dancer but, as an expressive artist. In my ten years of teaching at ODC, I have had the pleasure in contributing to the ballet curriculum for the Youth and Teen program. 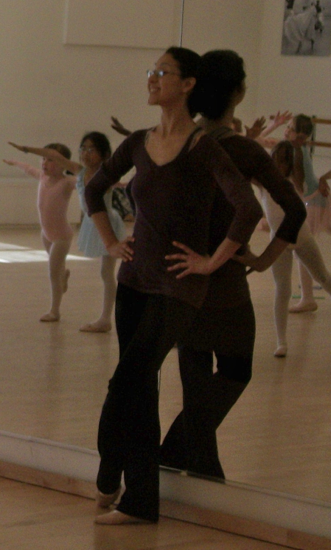 In 2008 I taught a Beginning Ballet Performance workshop for adults. Recently I had the tremendous opportunity to co-teach with Augusta Moore, the Ballet Program Director in her Beginning Ballet Workshop from September 2014 to May 2015. Also in May, I developed and presented an embodied History of Ballet lecture to the Youth and Teen ballet classes. Taught intermediate ballet to students accepted into the Performing Arts and Social Justice undergraduate program. The main focus of the class was clean execution of technique while developing artistic presence and intent. Taught beginning to advanced beginning ballet to youth and teens. Also substituted for beginning ballet adult classes. On Dean's list for three semesters. Invited to join the dance program's student company to the American College Dance Festival conference at Arizona State University. A rigorous and intense program of dance that included Ballet, Horton, Jazz, Floor Barre, West African, Pointe, and Improvisation. My dance education has taken me on many different paths. While my foundation is strongly rooted in classical ballet (specifically the Vaganova syllabus), I have always welcomed and sought out opportunities to learn other dance forms. This extra dimension gives my teaching a contemporary edge and helps inform the ballet technique. My teaching is also greatly influenced by somatic awareness and education. I have studied the Feldenkrais Method with Augusta Moore for the past twenty years. This summer I will begin a three year study in Body Mind Centering to become a certified Somatic Movement Educator by 2018. "Evolving into the New Year"
"Shedding Old Habit, Re-organizing for the New Year"
Washerwoman's Branle, and a traditional sword dance. ballet with the explosive power of breakdancing.